This jewelry box is made of premium grade tiger maple and zebrawood, which comes from West Africa. 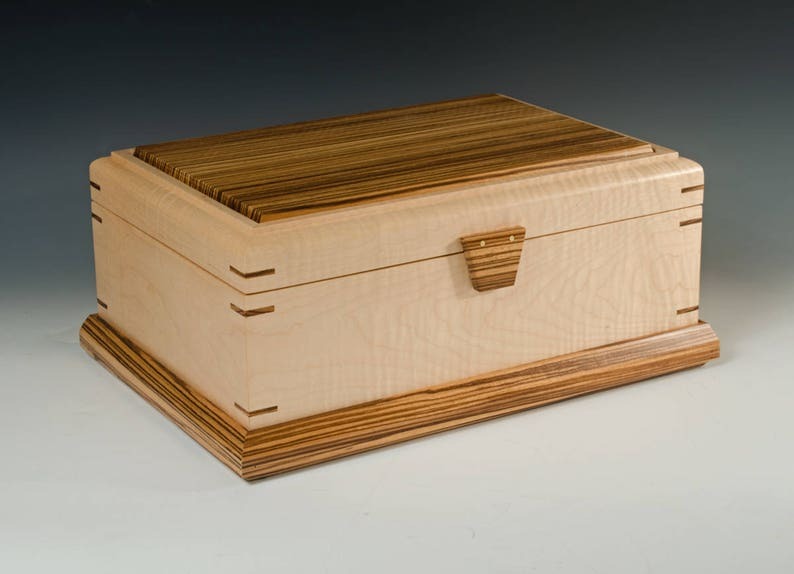 For this box I added a full width top tray that provides storage space appropriate for chains and necklaces. It also has a ring bar at one end. The tray lifts out easily to expose the lower level which has a removable divider grid to hold and separate the jewelry pieces. The hinges used are top quality, solid milled brass and made in America. They have built in stops that hold the lid in the open position as shown. The lining material is a high quality faux suede upholstery fabric which is elegant by very rugged. The entire box is finished with multiple coats of satin lacquer. Approximate overall dimensions are 13" wide x 10" front-to-back and 6" high.